Denial is no longer an option now that my second child’s high school graduation is just one month away. As another school year winds down I find myself casting wistful gazes at young women with baby strollers and daddys wiping smudges of ice cream off their toddlers’ faces. I wake up each morning feeling relieved to still count two children at home. I’m eager to do their laundry, prepare their favorite meals, and join them for a game of German Yatzy. “Make sure you keep busy!” has been my mantra for the past year of coping with my dwindling nest. I’ve taken this counsel to such an extreme that I have almost no free time. I’m toiling over my German citizenship book project, upping my hours at my job, and criss-crossing the city to check out every apartment that comes on the market within my desired five kilometer radius. Seven years after our first temporary move to Berlin, I’m ready to create my own more permanent nest here. Apartment hunting is a fun way to explore our favorite Berlin neighborhoods and get a peek into the city’s beautiful turn of the century Altbaus. I love the feeling of mystery about what we’ll discover when we step inside. There’ve been many surprises such as the penthouse that gave off the distinct feeling of a bordello, an apartment where all the interior walls were moveable, and one with a bathroom that looked like an outhouse. After going to 31 Besichtigungstermine (viewing appointments), finding an affordable 3 bedroom, 2 bath apartment with a balcony and an elevator in a historic building is starting to feel a little unrealistic. But a small penthouse in a newer building recently caught our eye. The best part: no need for renovations! When I’m feeling especially glum about the current state of political affairs, I idly wonder whether the portents of danger are greater in the U.S. or Germany. Which provokes more fear: the rise of Trump and Cruz in the U.S. or the rise of the far right Alternative for Germany which now has seats in half of Germany’s state parliaments? Compounding my sense of gloom is the threat of terrorism that looms over both countries. I scan the news for reassurance, looking for facts that will allay my fears. The AfD’s overall support in Germany, according to a new poll, is at 14%, one point higher than for the Greens. That’s bad news, but the combined support for Germany’s two main parties, Merkel’s CDU and the SPD, is 55%. Merkel herself maintains a 54% approval rating according to last month’s survey by the ARD broadcasting network, not bad for a leader who has been under siege for opening Germany’s doors to refugees. Through the first 12 primaries of 2016, combined Republican turnout has been 17.3% of eligible voters – the highest of any year since at least 1980. Democratic turnout so far is 11.7% – the highest since 1992, with the notable exception of the extraordinarily high turnout in 2008. My confidence in American democracy had been waning for years before we moved to Germany. Partisanship, ignorance, apathy….it was all so depressing. Germany has serious political problems to contend with, but Germans have much higher voter turnout than Americans and by most accounts they are better informed. “I could sit on the ground and weep. I’d forgotten what is was like to be in a country where people read,” says Thomas Geoghegan in Were You Born on the Wrong Continent? I highly recommend Geoghegan’s book to anyone exasperated with quality of life issues in America. His persuasive and entertaining work makes a solid case for European social democracy, especially the German model. There are some disturbing political trends in Germany right now, but I hope the higher levels of political engagement and participation here will prevent extremists from making further gains. Now that fewer refugees are arriving and relief workers have more time to manage the situation, there is reason to hope. What kind of mother kisses her kids goodbye and goes off to whip the masses into a xenophobic frenzy of opposition to Germany’s refugee policy? That was the question I pondered after reading the latest news stories about weekend clashes in Berlin between asylum activists and the right-wing Alternative for Germany (AfD) party. At the helm of the AfD is Frauke Petry, a 41-year-old mother of four with a background as a chemist and businesswoman. I didn’t expect a key leader of Germany’s anti-migrant zealots to be a relatively young and attractive woman. She’s been compared to France’s Marine Le Pen and accused of appearing entirely reasonable while supporting the xenophobic far right. This is the face of right-wing extremism in Germany. I guess the fact that she’s a mom pushed my buttons. I don’t suspect we’ll find her kids doing volunteer work at any refugee shelters or standing around any train stations with “Refugees Welcome” signs. Nor do I suspect that Petry talks to her kids about the moral implications of the refugee crisis or the studies which show that EU countries have the capacity to welcome a vastly larger share of refugees than they have been doing so far. Instead, she calls for stronger ties to Russia and more children for German families, hoping to inspire a new generation of German mothers who follow the AfD’s politics of hate. The AfD began as an anti-Euro party that pushed for a “Grexit” from the euro. Now that the AfD has staked out a position on the far right as Germany’s anti-immigrant party, let’s hope it will soon make its own exit from Europe. 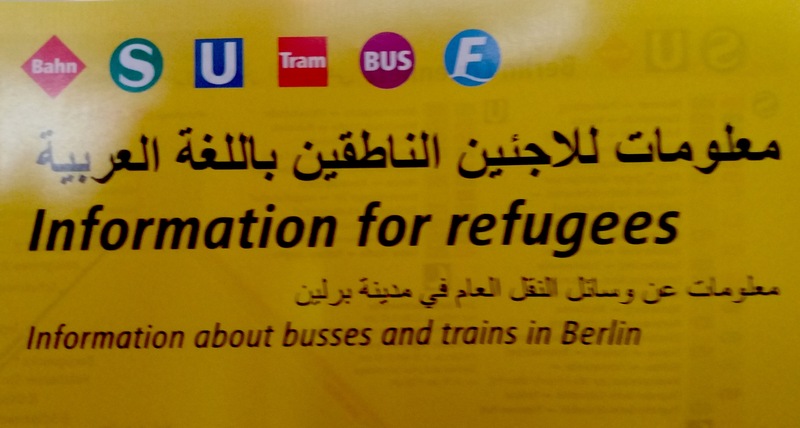 Signs of a refugee crisis are not readily apparent to an ordinary resident of Berlin. Traversing the city each day I hear the same mix of Russian, Turkish, English, German and Arabic that I’m used to hearing in this city that is Germany’s closest approximation to a melting pot. But the media reports that Germany is expected to receive more than one million asylum seekers this year and that fights are breaking out in Berlin’s central refugee registration center. Angela Merkel has assured the public that “we will manage”, but opinion polls tell us that many Germans are not convinced. I didn’t know whether to expect chaos or calm before my first volunteer shift at the refugee center in Rathaus Wilmersdorf this week. On earlier trips past the building I’d seen few signs of the hundreds of refugees given temporary shelter there. 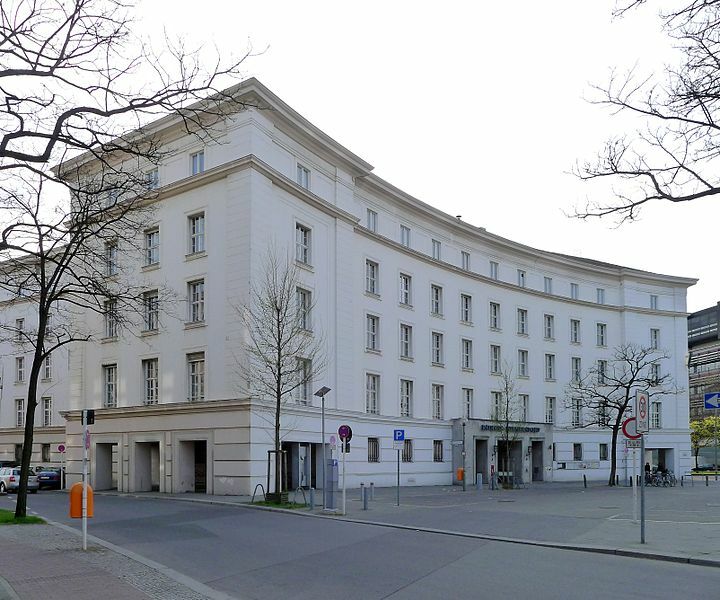 It seemed like one of Berlin’s many historical twists of fate that someone who fled Syria or Afghanistan would survive the trip to Germany and end up in a municipal office building that was a vestige of the Nazi era. The four hours I spent inside the building confirmed everything I’ve read about why refugees have made Germany their first choice destination. More than 800 people are living in a clean and well-organized environment where they have access to medical care, regular meals, and vast supplies of clothing and other essentials. Abundant volunteers help out in all areas of the building and provide translation services in Arabic, Farsi, and Urdu. Berliners bring a steady stream of supplies to the donation drop-off point. My very limited exposure to Berlin’s refugee relief measures reassured me that the German traits of efficiency and hard work are in ample evidence (from Germans and non-Germans alike). A disturbingly alluring devil, a ram that may intuit its imminent slaughter, and dancers entangled in a web of trust and rebellion are all elements of the Obedience (Gehorsam) exhibit at the Jewish Museum Berlin. The visitor is greeted by a seemingly endless Brady Bunch array of children who tell us that they are Isaac…or that they are Ishmael. Once you tear yourself away from the children, you embark on a journey through a series of rooms that dramatize the biblical story of God’s command to Abraham to sacrifice his son. There’s still time to see this provocative exhibit before it closes on September 13th. Your response to the multitude of sensations that await you in this 15-room display will probably depend on whatever issues of sacrifice, obedience and trust you face in your own life. As a secular Jew, my willingness to make sacrifices for my children comes before obedience to any higher authority. But have I made the right sacrifices, expected obedience at the right times for valid reasons, and earned the trust of my children? I wish I had an answer key because the first of our three children is just a year away from leaving the nest for college. How strong are the family bonds that have been woven over the past seventeen years and will they remain intact and even grow stronger when our children become adults? The Obedience exhibit reminds us of the ways that we overlook and sacrifice children in modern times. 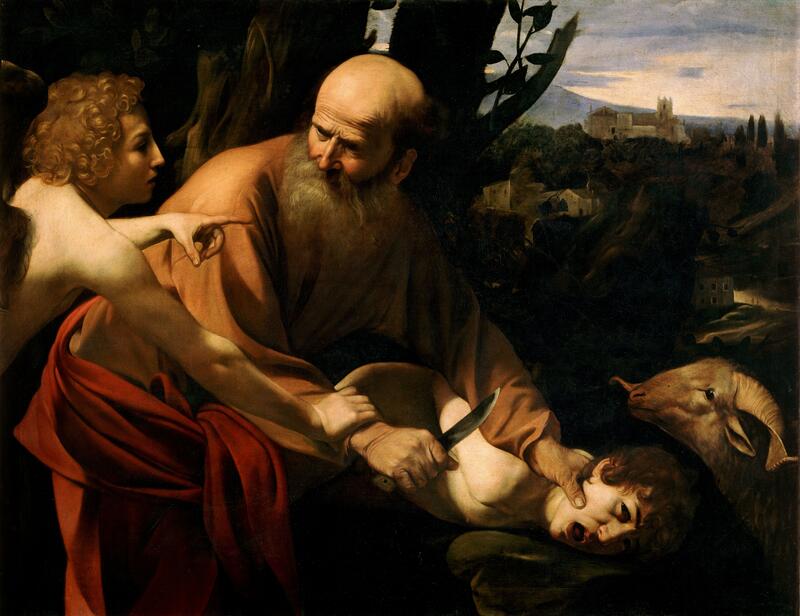 The biblical story of Abraham and Isaac has parallels in contemporary commands to fight wars, dominate people, and devote ourselves to causes that harm others. You may have a different take-away from this expansive multi-media installation, but it’s likely you will find the experience as stimulating as I did. They came from France, Hungary, Israel, Poland, Turkey, Australia, The Netherlands, Germany, and even a few from the U.S. Though internationally diverse, they were not so different from the college kids who came through my seminar and lecture courses at Montana State University. They engaged with me in a “community of learners” even while I was still learning the ABCs of my new role as a German university instructor. Inside the classroom I was back in a comfortable and familiar role, but the outside environment was quite different. Instead of trudging through the snow to meet my students on the MSU Bobcat campus, I rode the S-bahn and tram out to Oberschöneweide for my weekly three-hour Business Communications course at the Hochschule für Technik and Wirtschaft. 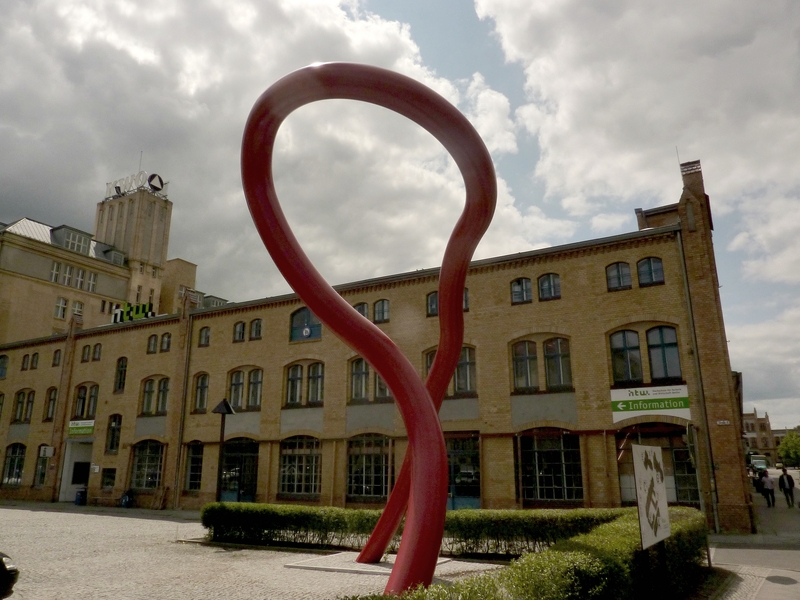 The HTW campus sits on the site of a former cable factory in the middle of one of Berlin’s oldest industrial districts. The area was a major economic center under the former communist GDR, but fell on hard times after the wall came down. Located right on the river Spree, this revitalized industrial setting offers the campus community a sandy beach and terrace complete with refreshments and plenty of space to study or socialize. I’ll be back there next semester. 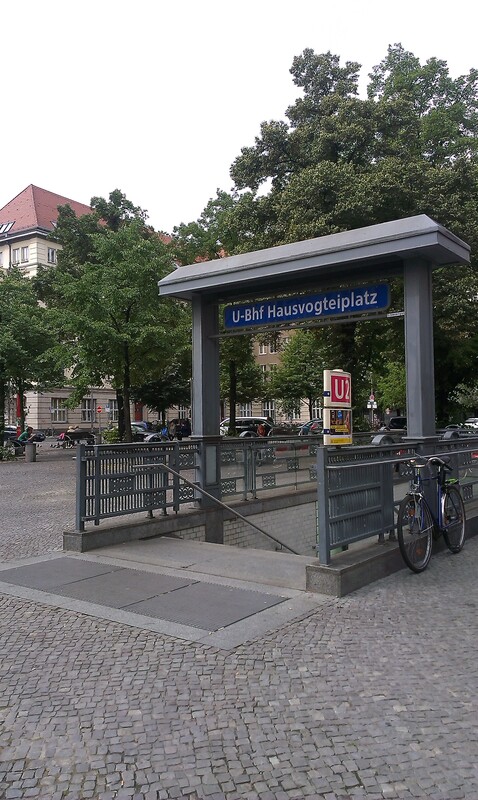 On Mondays I travelled to Hausvogteiplatz in Mitte for my weekly seminar on Jewish migration to Germany at Humboldt University. Developed and taught with Dr. Agnieszka Pufelska, a colleague and friend from the University of Potsdam, this course allowed me to compile and share what I have learned (and am still learning) about the Jewish experience in Germany. Our international group of students journeyed with us through turbulent chapters of history from the late 19th century until today, and delved into difficult topics such as right and left-wing contemporary anti-Semitism and the hazards of child-bearing in Displaced Persons camps after WWII. We look forward to offering this seminar again, both at Humboldt and other universities. Now it’s time for a summer break and a chance to hang out on the beach with my family in Sardinia. But it won’t be long before I begin my next new assignment, teaching for the Council on International Educational Exchange’s new Global Institute Berlin. It felt more like Mardi Gras than Labor Day in Berlin. With all of the partying going on, I was too distracted to focus on the political and social messages of the day. We merged with the festivities as soon as we boarded the U12 and headed into Kreuzberg with all the beer and wine guzzlers who were a few decades younger than us. Our destination was the MyFest, an annual event to celebrate Spring with enough food, music, and cultural offerings to put even the most dour Berliners in a happy state of mind. Squeezing our way through the crowds at Kottbusser Tor, we were expecting to come across at least one of Berlin’s typical protest scenes. But although the area was the site of May Day violence and riots in the 1980s, the MyFest is now mostly a hotbed of communal fun. 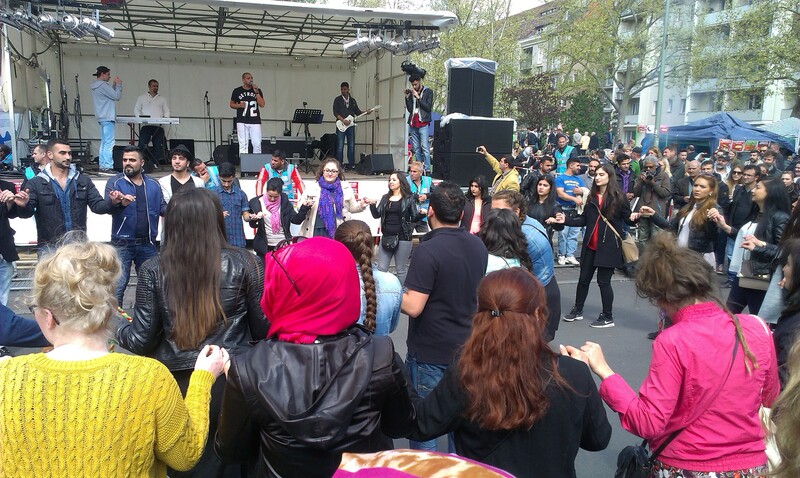 Relieved at the absence of tension in the air, we settled in to enjoy some great köfte and Turkish music at Mariannenplatz. Despite the holiday, it was soon time to head back home so I could do some afternoon reading for my seminar on Jewish migration to Germany. During our Rückfahrt (return trip), I was pleasantly surprised to come across this new poster at the Zoologischer Garten train station. 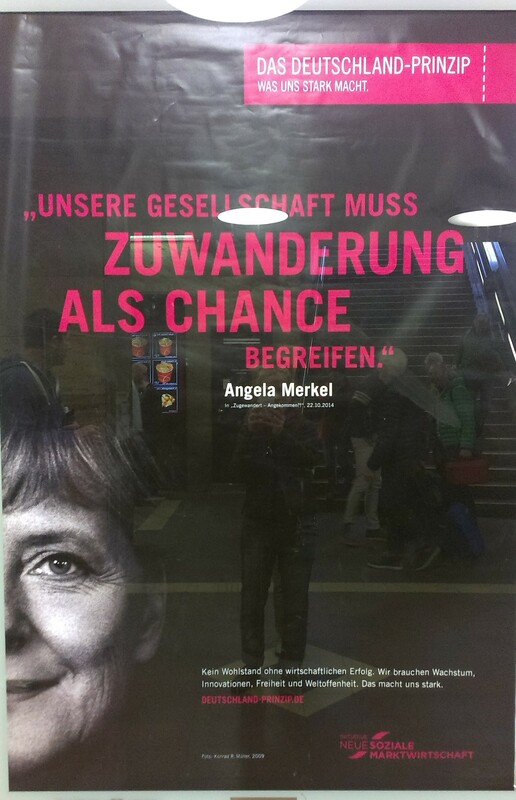 Angela Merkel is asking our society to recognize immigration as an opportunity. This was a fitting message for Labor Day, especially given Germany’s looming population decline and the particularly strong fall in the proportion of working-age people expected by Germany’s statistics office. I look forward to discussing the poster with our seminar students on Monday. A tiny ripple in the realm of American higher education occurred last week as a result of National Adjunct Walkout Day. Here in Berlin I felt a passing sense of solidarity with all those faculty who agitated for better terms of employment. Having endured close to fifteen years of sub-par working conditions as a Montana State University adjunct, I was cheered by the prospect of better pay, job security, and benefits for my colleagues back in Bozeman and the rest of the country. The walkout day came at a time when I am preparing to walk back in to university teaching in Germany. 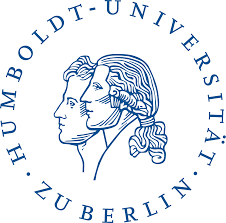 I’ll be co-teaching a seminar at Humboldt University’s Berlin Perspectives program next semester. Since undergraduate education is free in Germany, I shouldn’t have been surprised to discover that I’ll receive substantially less pay than what I earned as an adjunct in the States. That’s okay. The seminar is on Jewish migration to Germany, a topic I’m already deeply engaged with and eager to facilitate with a group of international students in Berlin. My co-instructor is a Jewish Studies professor who is giving me a crash course on Germany’s higher education system. So far I’ve learned that attendance at classes is not mandatory and that students tend to come and go as they please. German professors seem to have a higher academic ladder to climb than their counterparts in the States, in many cases needing the habilitation, a process which can require doing something like a second dissertation. I’m still confused by German academic ranks and titles, but I do know that I’ll be a Lehrbeauftragter, a nice German word for an adjunct. I’ll also soon find out what it’s like to teach at a German Hochschule. These higher education institutions are not high schools, but specialized colleges that offer vocational and technical degrees. Although I won’t earn as much as a German autoworker or an American adjunct, I’m looking forward to walking into my first classes. It’s not often that our teenagers accompany us on a Sunday afternoon outing in Berlin. But today was different. 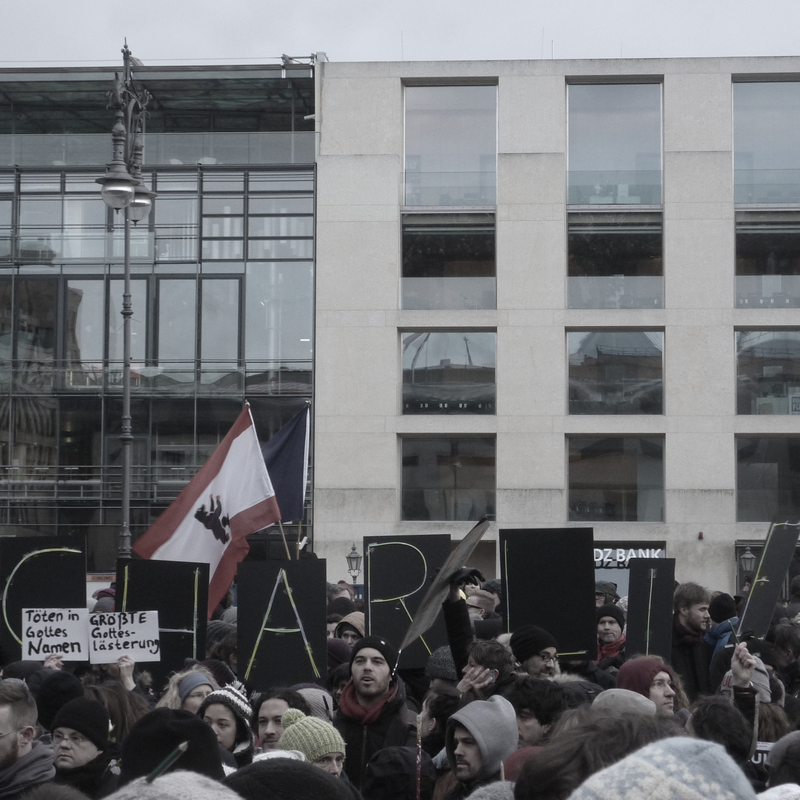 Today we joined thousands of Berliners at Pariser Platz to remember the victims of last week’s terror attacks in France. As we were absorbed into the quiet calm that enveloped the massive crowd, my angst about bringing our children to the gathering quickly evaporated. There were no speeches, no clashes, no countervailing forces to thwart the simple expressions of sympathy and unity. The signs, pens, flowers and candles that were held high spoke louder than any voice that might have come from a podium. Olivia, who is 15, had these thoughts: The winter air was frigid as a group of Berliners came together before the French embassy, their numbers swelling to 18 000 despite the cold. They assembled out of a sense of fraternity and empathy for the lives lost in the recent attack and to make their message clear: that freedom of the press, a basic right in all democratic countries, will not be infringed upon. 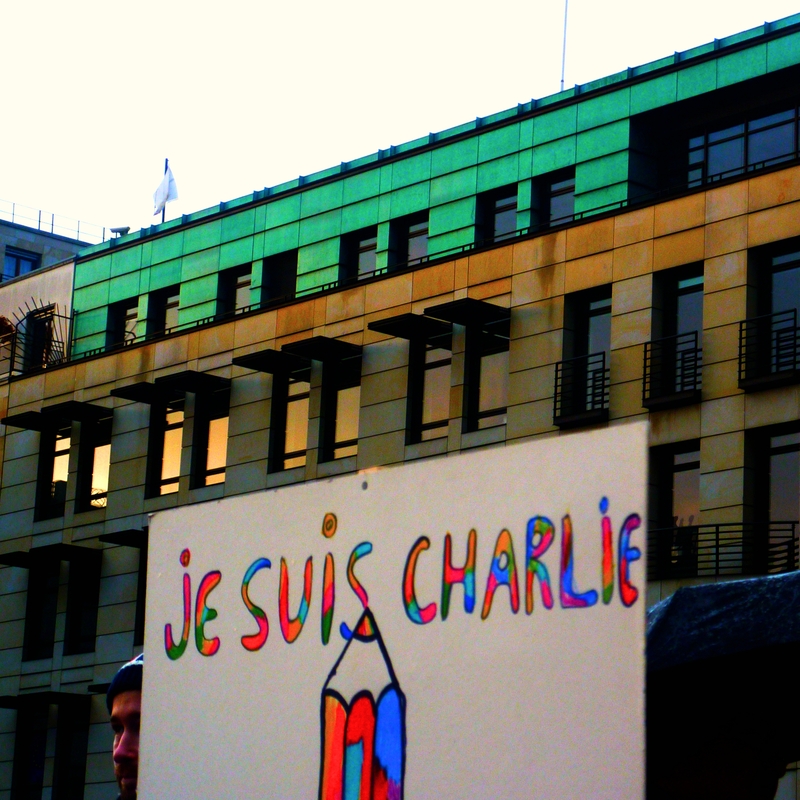 Although the gathering was calm, quiet even, the air of solemnity only served to underscore the importance of the support for Charlie Hebdo, and of recognizing that acts of terror like that against the French newspaper are dangerous to everyone everywhere, as the right to one’s own opinions and the expression of them is a fundamental human right. Photos courtesy of Avery Swarthout. Find more of his photos on Instagram @through_golden_eyes. Were there more tragedies around the world this year than in most years? It feels that way, as if the tempo of human cruelty grew at a steady pace throughout the year that wrung every last ounce of shock and sorrow from us. One tragedy that hit me especially hard as a Montanan living in Germany was the death of Diren Dede, a German exchange student who was shot and killed in April for trespassing in a Missoula man’s garage. The vigilante act of one Montana homeowner destroyed a family and gave the world one more display of the ugly face of America’s gun culture. I gave up my right to own a gun when I moved from Montana to Germany, a country where gun ownership is a privilege rather than a right. The chance that one of my children will be shot to death is lower in Germany than in the States. NPR Berlin reported last year that while Germany has a relatively high rate of gun ownership, it also has a low rate of gun homicides compared to the U.S. One reason is that gun ownership in Germany must be justified as “necessary,” and personal protection or self-defense do not count for this purpose. Germany also requires owners to store guns in a locked safe and allows law enforcement to make random house checks for compliance. Diren Dede’s parents said their son described Missoula as a paradise. That’s how my children describe the state that they are so proud to call home. We express our sorrow along with many others in Montana, Germany, and elsewhere. The tragedy that struck this German exchange student in paradise shows why I’m willing to give up one of my civil rights for the privilege of living in a more secure society.